Do you need new tills for your business? Replace your old tills with the best electronic point of sale systems in the business at affordable prices with CCM EPoS. At great value for your money, our electronic tills for sale will be a worthwhile investment for your business. Our electronic tills are specifically manufactured to tailor both the retail and hospitality sectors. So regardless of whether you own a restaurant or a shop, our personalised tills will increase your profits. If you feel that your tills could do with an update, take a look at the electronic tills in our sale. Want to know what makes our EPoS systems the best in the business? Every piece of equipment is downloaded with innovative programs that will transform the way your run your company for the better. Below, we have listed some of the features you will benefit from when you choose our electronic sale tills. From discounts and promotions to on-screen prompts, managing and accessing your till has never been easier. Simplifying sales and efficient till management is at the heart of each till design. What we aim to do is ease your sales transactions so that you receive happy customers every time. Ensure you have enough of the right stock when you use our stock control systems. Managing your products is vital so what you need is a system where you can keep up to date with all of your essential data. Our EPoS Stock Control does just that. With a complete overview of all of your PoS terminals, you will manage your stock with ease. With our electronic tills, you will have every opportunity to discover the cloud office software that your data will be connected to. If you decide to install our Web-based Solutions, it will let you access real-time data no matter where you are. So whenever you need to make any changes to your stock, you can do it online. 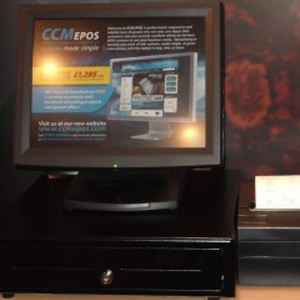 By going to CCM EPoS, you will be investing in a service that is dedicated to helping your business. Our ethos is all about giving a personalised and reliable support network. You won’t have to worry about a thing as our committed team keeps an eye on your systems and make sure it runs smoothly. This includes offering monthly reviews, cover, and, if necessary, remote support. Whenever you need our help, we have a consultancy service that will answer any of your questions. Get in quick before our offers end and contact CCM EpoS today.